FeaturedCustomers awards Procore highest overall customer success score. Today FeaturedCustomers released the to give prospects better insight on which Construction Management Software would work best for their business according to real customer references. Market Leaders – Procore, Oracle Aconex, Viewpoint, Plangrid, BlueBeam Software, B2W Software, e-Builder, Jonas Construction Software, Autodesk BIM 360, Trimble, UDA Technologies, Newforma, and HCSS were given the highest “Market Leader” award. Market Leaders are vendors with a substantial customer base & market share. Market Leaders have the highest ratio of customer reference content, content quality score, and social media presence relative to company size. 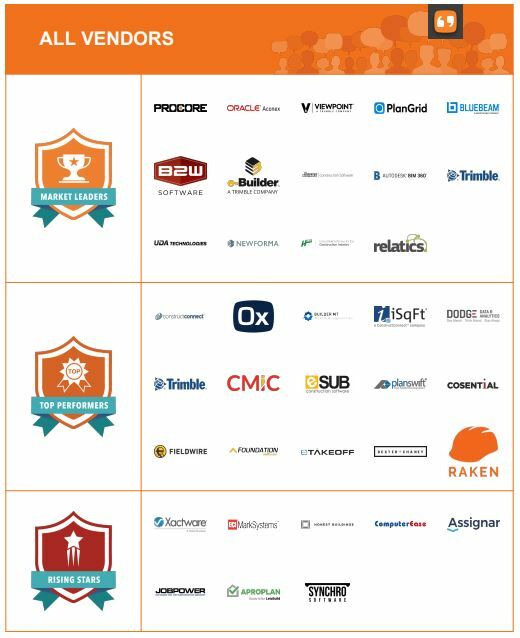 Top Performers – ConstructConnect, Oxblue, BuilderMT, Relatics, iSqFT, Dodge Data & Analytics, Trimble MEP, CMiC, eSUB, Planswift, Cosential, Fieldwire, On Center, Dexter + Chaney, Foundation Software, etakeoff, and Raken were awarded “Top Performer” honors. Top Performers are vendors with significant market presence and enough customer reference content to validate their vision. Top Performers products are highly rated by its customers but have not achieved the customer base and scale of a Market Leader relative to company size. Rising Stars – Xactware, ECi MarkSystems, Honest Buildings, ComputerEase, Assignar, Jobpower, Aproplan, and Synchro Software were awarded the “Rising Star” honor. Rising Stars are vendors that do not have the market presence of Market Leaders or Top Performers, but understand where the market is going and has disruptive technology. Rising Stars have been around long enough to establish momentum and a minimum amount of customer reference content along with a growing social presence. The customer success report is based on over 3200 pieces of verified customer reference content. A vendor’s overall customer success score is reached via a weighted average of their Customer, Social, and Company Scores. Of the 79 vendors listed in the FeaturedCustomer’s Construction Management category, 38 vendors met the minimum requirements needed to be considered for the customer success report.